Well, it's been a while since I've posted any Photos of the Day, hasn't it? Too long, I know. Let's get back into it, shall we? 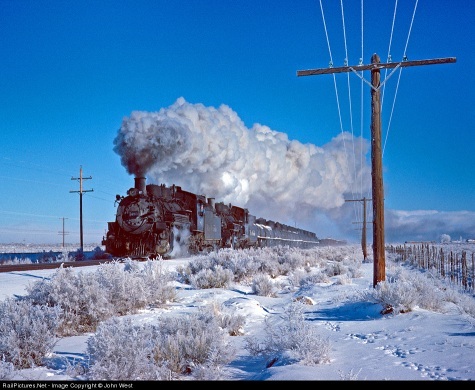 John West is a favorite photographer of mine, and it's not just because he had the good sense to be in Colorado photographing Rio Grande narrow gauge in the 1960s. It's because he didn't have any common sense standing out there in the cold snow waiting for two Rio Grande locomotives to chatter past with a load of Gramps Oil cars headed for Cumbres Pass and the oil fields beyond. Remember, pain is temporary, but film is forever. Thanks, Mr. West! What a beautiful picture! Looking forward to more of Mr. West's photos.